The overarching science questions have guided site selection, identification of dissertation topics and the base monitoring. The specific hypotheses have guided the dedicated monitoring and sampling, individual experiments, and repeated experiments with controlled boundary conditions. The Hydrological Open Air Laboratory (HOAL), Petzenkirchen, is situated in the western part of Lower Austria (48° 9’ N, 15° 9’ E), some 100 km west of Vienna. Elevations range from 268 to 323 m a.s.l. The subsurface consists of Tertiary sediments of the Molasse zone and fractured siltstone. Soils include Cambisols and Planosols with medium to poor infiltration capacities. The climate is humid with mean annual temperatures around 10°C, precipitation around 800 mm/yr and runoff around 200 mm/yr (equivalent to 4 l/s at the 66 ha catchment outlet). 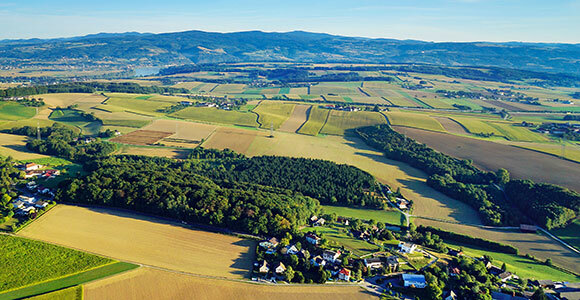 As many of the overarching science questions are related to erosion and nutrients, it is an advantage that most of the catchment is used for agricultural purposes where sediment and nutrient fluxes tend to be bigger than for forested or urban settings. The crops include winter wheat and maize. Manure and fertilizer application are accurately known from farmers’ book keeping which are useful for estimating nutrient and faecal pollution inputs. There is a strong human footprint in the catchment which adds richness to the research. The diversity in flow and transport processes ensures that the HOAL is representative of a range of catchments around the world and the specific process findings from the HOAL are applicable to a variety of catchment settings.